Southwest Michigan Christmas Tree Farms: choose-and-cut Christmas trees, Tree lots with pre-cut trees, stands, sleigh rides, hay rides and related winter events and fun! Whether you want to cut your own tree, pick a live tree and have it cut for you, buy a tree already cut or buy a living tree you can plant, this page provides detailed listings of Southwest Michigan 's choose-and-cut Christmas tree farms, places to buy pre-cut (also called pre-harvested and fresh-cut) trees, stands, sleigh rides, hay rides and related winter events and fun. 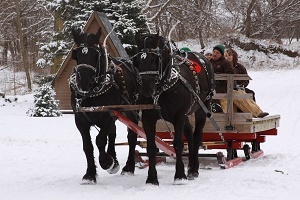 Some listings are for tree farms, others are tree lots, and some only offer hay rides, sleigh rides or other winter events. READ EACH LISTING to know what each facility offers. The farms are listed further down this page, so scroll down the page! Since this service is free and open to ALL Christmas tree farms, not just those who belong to an association or pay for an ad, like almost all other websites do, this is the most complete and current listing available! I'm always looking for more to add, and to correct any inaccuracies or errors, so if you encounter any, please email me ! And please tell the farmer you visit in Southwest Michigan that you found their farm here! I need the farmers to realize that you found them here so that they will keep their information up to date! Badger Country Christmas Trees - Christmas trees-you choose and you cut, Precut Christmas trees, Christmas wreaths, Shaking, baling, tree stands, tree bags, Precut trees Christmas trees, wreaths and garlands, Tall (9ft+) trees, living trees (in containers), wagon/sleigh rides, food & drinks, Santa visits (call for dates and times), petting zoo. 1553 115th Avenue, Otsego, MI 49078. Phone: 269-217-6743. Open: from Friday after Thanksgiving; Monday-Friday 12 pm-5pm; Saturday and Sunday 10 am-5:30pm; Santa is here on Saturday 2-5pm and Sunday 2-5pm. Pre-cut and u-cut trees. Saws are provided , Drill and bale your tree for no addition cost , Wreaths , Roping , Swags . , Greenery burlap bags , Tree bags , Tree Stand,s. Concession will be open on Saturdays and Sunday. 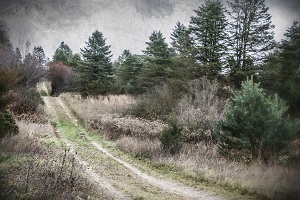 200 acre evergreen farm located in Otsego, Michigan. We offer choose and cut Christmas trees, wreaths and roping, horse-drawn wagon rides to the fields. Come enjoy a family tradition! 2661 64th Street, Fennville, MI 49408. Phone: 269-857-4429. Email: linda.roerig@yahoo.com. Open: on weekends beginning the day after Thanksgiving from 11 am to 4 pm. Directions: Click here for a map and directions. Payment: Cash, only. Click here for our Facebook page. You-Choose and You-Cut varieties: Blue Spruce, Scotch Pine, White Pine. Ganges Tree Farm - Christmas trees-you choose and you cut, baling, Precut trees Christmas trees, wreaths and garlands, Tall (9ft+) trees, living trees (in containers), food & drinks, Santa visits (call for dates and times), you may reserve a tree in advance, Christmas gift shop. G732 121st Ave, Fennville, MI. Phone: (269) 543-8108. Email: Kammenzind@allegan.net. Open: UPDATE for 2018, Does anyone have current information, are they still in business and open? If so, please write me, last reported hours were 9 am to dusk. Open: November 20. You-Choose and You-Cut varieties: Blue Spruce, White Pine, Douglas Fir, Concolor Fir, Fraser Fir. Janke Tree Farm - Christmas trees-you choose and you cut, baling, shaking, tree stands, tree bags, Precut trees Christmas trees, wreaths and garlands, Tall (9ft+) trees, wagon, food & drinks, you may reserve a tree in advance. 2676 111th Avenue, Allegan, MI 49010. Phone: (269) 673-7367. Open: Monday to Friday 3 to 6 pm, Saturday 9 am to 6 pm, Sunday from 12 pm to 6. Janke Tree Farm has Wagon Rides on Weekends. Click here for a link to our Facebook page. Leber Christmas Tree Farm - Christmas trees-you choose and you cut, Wagon rides to the field (sleigh rides if there is snow), wreaths, tree cleaning & wrapping, gift shop with free coffee & hot chocolate, saws are provided,Shaking, baling, tree stands, tree bags, Precut trees Christmas trees, wreaths and garlands, Tall (9ft+) trees, food & drinks, you may reserve a tree in advance. 2439 36th Street, Allegan, MI 49010. Phone: 616-673-3378. Email: rleber@allegan.net. Directions: Located northwest of Allegan, take M-40 towards Holland approximately 3 miles, turn right (north) on 36th Street (Allegan Dam Road is on the left). Continue north on 36th Street past the second stop sign, the farm is located on the right, approximately 2.8 miles north of M-40. Watch for our signs. Open: Friday from 12 pm to dark, Saturday and Sunday 9 am to dark. You-Choose and You-Cut varieties: Scotch Pine, Blue Spruce, Douglas Fir, Fraser Fir. Peterson's Riverview Nursery - Christmas trees-you choose and you cut, Shaking, baling, tree stands, tree disposal bags, Precut trees Christmas trees, wreaths and garlands, Tall (9ft+) trees, living trees (in containers), wagon rides. 873 26th Street, Allegan 49010. Phone: (269) 673-2440. Email: jptrees@accn.org . Open: from the day after Thanksgiving, weekends all day and Monday to Friday from noon until dark. You-Choose and You-Cut varieties: Blue Spruce, White Pine, Douglas Fir, Concolor Fir, Fraser Fir, Canaan Fir. 1025 Whitmore Rd, Hastings, MI 49058. Phone: (269) 945-4014. Email: kk4014@yahoo.com. Open: Friday after Thanksgiving until December 21, 2016; weekends 12 pm to 5:30pm. Weekdays 3 to 5:430 pm. Directions: Located south of M-37 half way between Middleville and Hastings; South of M-37; 1/2 m. south of M-3. 6891 Tischer Road, Lake Odessa, MI 48849. 2268 W Rockey Weed Rd, Stevensville, MI 49127. Phone: 269-422-2731. Email: rlbredeweg@aol.com. Open: Friday and Saturday 10 am to 6 pm; Sunday thru Thursday 12 to 6 pm; Friday after Thanksgiving to December 23. Directions: I-94 to exit 22 in Michigan. Go east on John Beers Road to first blinking light in Stevensville. Turn right onto Saint Joseph Ave, go 1 miles south, then turn left onto W Rockey Weed Rd, 1/3 mile to Bredeweg Acres. Click here for a map and directions. Payment: Cash, Check. We "drill" Trees for the "ANSWER STAND". This stand could save your marriage. You-Choose and You-Cut varieties: Canaan Fir, Colorado Blue Spruce, Fraser Fir. PreCut varieties: Canaan Fir, Colorado Blue Spruce, Fraser Fir. 4403 Spring Creek Road, Galien, MI 49113. Phone: (269) 545-8125. Email: pinecrestkris@yahoo.com. Open: 9 am to 6 pm EST, daily, starting the day after Thanksgiving through December 23rd. Tractor drawn wagons take customers to field during the week. Click here for our Facebook page . Enjoy your ride out to the field to pick out that perfect Christmas tree on either our horse drawn wagon (weekends only or tractor drawn wagon. Wagons are running regularly on the weekends and one will be right around the corner when you are ready to come back to the Christmas shop with your prize. Yule Tide Acres - Christmas trees, either pre-cut or u-cut. 8466 M-62, Berrien Center, MI. Phone: 616-461-3111. 486 Babcock Road, Bronson, MI 49028. Phone: 517 369-1694. Open: Starting the day after Thanksgiving Monday to Friday 12 pm until dark; Saturday and Sunday 9 am until dark. Directions: Take M-86 West from the Coldwater Airport for 8 miles. Turn right(North)on Babcock Road and go 1 mile to farm entrance on left(west). From Bronson take Matteson Lake Road 4 Miles North to M-86, turn right to Babcock road, and left(North)1 mile. Click here for a map and directions. Payment: Cash, only. Come early and tag for later cutting. Tall trees 12ft+. Click here for a link to our Facebook page. You-Choose and You-Cut varieties: Balsam Fir, Blue Spruce, Colorado Blue Spruce, Fraser Fir, Norway Spruce, White Pine, White Spruce. You-Choose and You-Cut varieties: Balsam Fir, Black Hills Spruce, Blue Spruce, Canaan Fir, Douglas Fir, Eastern White Pine, Fraser Fir, Norway Spruce, White Fir (Concolor Fir), White Spruce. 13771 Gorsline Road, Marshall, MI 49068. Phone: 268-781-2433. Open: See their website for for hours and availability. Directions: We are located in Battle Creek, just a short drive away from Marshall, Albion, Charlotte, Jackson, and Springport! See their website for directions. Payment: Cash, Check . Whether you'd like to cut your own Christmas tree, have our tree spade drop off a tree order for your office, or decorate your home with wreaths and roping, Wilson's Tannenbaum Farm has everything you need to welcome the season. You-Choose and You-Cut varieties: Fraser Fir, Blue Spruce, Concolor Fir, Norway Spruce, White Pine, and White Spruce. PreCut varieties: Fraser Fir, Blue Spruce, Concolor Fir, Norway Spruce, White Pine, and White Spruce. Living, rooted tree varieties: Fraser Fir, Blue Spruce, Concolor Fir, Norway Spruce, White Pine, and White Spruce. 21515 Crane Street, Dowagiac, MI 49047. Phone: 269-782-4650. Email: info@ButlerTrees.com. Open: Thanksgiving Friday to December 23rd. Click here for current open hours, days and dates. Directions: Take Marcellus Highway 7 miles East of Dowagiac to Decatur Road, turn left and go 1/2 mile to Crane Street, turn left and we are 1/2 mile on the left. View website for a map to the farm. Click here for a map and directions. Payment: Cash, Visa/MasterCard. You-Choose and You-Cut varieties: Balsam Fir, Blue Spruce, Colorado Blue Spruce, Douglas Fir, Eastern White Pine, Fraser Fir, Scotch Pine, White Fir (Concolor Fir), White Pine. PreCut varieties: Balsam Fir, Blue Spruce, Colorado Blue Spruce, White Fir (Concolor Fir), Douglas Fir, Eastern White Pine, Fraser Fir, Scotch Pine, White Pine. 51150 Leach Road, Dowagiac, MI 49047. Phone: (269) 424-5896. Email: cejones@beanstalk.net . Open: Open daily November 23 - December 22 from 1-6pm Wednesday - Friday and from 9 am - dusk on Saturday and Sunday. Directions: Click here for current open hours, days and dates. Click here for a map and directions. Our products are usually available in November, December. Open: Wednesday to Friday 1 pm to dusk; Saturday and Sunday 9 am to dusk. Payment: Cash, Check, Visa/MasterCard. Farm phone 269-424-7040 We have hot mulled cider. We do not have a food stand. U-cut from twenty acres of pine, spruce and fir Christmas trees in our fields or fresh-cut trees under cover in our large greenhouse. Shop warm and dry. Wreaths and garland made on the farm. Living trees. Free hot spiced cider. Free tree shaking and wrapping. . Michigan SNOWFRESH trees. You-Choose and You-Cut varieties: Balsam Fir, Blue Spruce, Canaan Fir, Colorado Blue Spruce, White Fir (Concolor Fir), Fraser Fir. PreCut varieties: Balsam Fir, Blue Spruce, Canaan Fir, Colorado Blue Spruce, White Fir (Concolor Fir), Fraser Fir. Good's Christmas Trees - Christmas trees-you choose and you cut, Shaking, baling, tree stands, tree bags, Precut trees Christmas trees, wreaths and garlands, Tall (9ft+) trees, you may reserve a tree in advance. 1144 W. Kalamo, Charlotte, MI 48813. Phone: (517) 543-7864. Email: dgoodforest@gmail.com. Open: Weekdays 3 til dark, Saturday 9 am to dark, Sunday from 12 pm to dark. You-Choose and You-Cut varieties: Scotch Pine, Blue Spruce, White Spruce, White Pine, Douglas Fir, Norway Spruce, Concolor Fir, Fraser Fir, Balsam Fir. Morrissey Tree Farm - Christmas trees-you choose and you cut, Shaking, baling, tree stands, Precut trees Christmas trees, wreaths and garlands, Tall (9ft+) trees, you may reserve a tree in advance. You-Choose and You-Cut varieties: Scotch Pine, Blue Spruce, White Spruce, White Pine, Douglas Fir, Norway Spruce. 16500 Forest Hill Road, Grand Ledge, MI 48837. Phone: (517) 627-6204. Email us at: (517)627-6204. Open: Monday to Thursday from 4 pm to 5:30 pm and Friday to Sunday from 10 am to 5:30 pm; Thanksgiving Day to Christmas Day. Directions: From I-96 take the Grand River Avenue exit (90). Go 1/2 mile west to Forest Hill Road. Turn Left on Forest Hill Road. Go 3/4 mile to farm on right. Click here for a map to our farm. Also sell wreaths, grave blankets and Landscape trees .We have taller precut Frasers additional costs. In the fields we have 5 types of spruces, 6 types of firs and also white pine. We also have fresh wreaths. Come see Prince and Duke for a free wagon ride. They will be here December 3, 4, 10 & 11. Don't forget the free hot chocolate, candy canes and cow train rides. 1749 E. Centre Ave, Portage, MI 49002. Phone: 269-323-1094. Email: corstange.1749@gmail.com. Open: Sunday to Tuesday, from 1 pm to 6 pm; Wednesday and Thursday, from 1 pm to 7 pm; Friday and Saturday, from 9 am to 7 pm from November 25 through December 23 or when sold out. Directions: From I-94 exit Portage Road; Go South to Centre Avenue; Turn West about 1/2 mile. From US-131 exit Centre Avenue; Go East 4 miles. Click here for a map and directions. Payment: Cash, Visa/MasterCard, Discover. Click here for our Facebook page. Greenhouse is staffed weekdays at 9 am. Additional tree service can be obtained by calling ahead. PreCut varieties: Black Hills Spruce, Douglas Fir, Fraser Fir, Scotch Pine. 16540 South 21st Street, Vicksburg, MI 49097. Phone: 269-649-0458. Fax: 269-649-0414. Email: info@mottfarms.com. Open: Friday after Thanksgiving to December 16th; Tuesday to Sunday, from 12 pm to 7 pm. Directions: US 131, turn east on XY Avenue. Turn south on 21st Street. Click here for a map and directions. 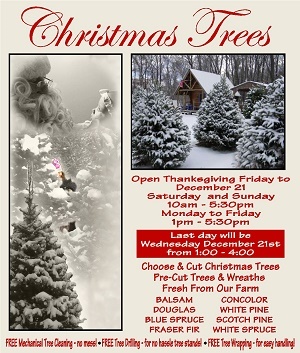 Open for Christmas trees from Friday after Thanksgiving until December 16th. Payment: Cash, Check, Debit cards, Visa/MasterCard. PreCut varieties: Blue Spruce, Colorado Blue Spruce, White Fir (Concolor Fir), Douglas Fir, Fraser Fir, Norway Spruce, White Fir (Concolor Fir), White Pine, White Spruce. Living, rooted tree varieties: Blue Spruce, Colorado Blue Spruce, White Fir (Concolor Fir), Douglas Fir, Fraser Fir, Norway Spruce, White Fir (Concolor Fir), White Pine, White Spruce. A visitor writes on February 01, 2019: "Mott Farms no longer does u-cut Christmas Trees and the Christmas barn is closed. Please update your website. Call If you have any questions (269) 649-0458"
30205 Fawn River Road, Sturgis, MI 49091. Phone: 269-651-7471. Email: bill8jan@charter.net. Open: Saturday and Sunday 10 am to dark: Full service (shaking, drilling, baling) Monday to Friday 10 am to dark: Limited services. Directions: Click here for a map and directions. Payment: Cash, Check. U-Choose and Cut varieties: Balsam Fir, Colorado Blue Spruce, Fraser Fir, White Fir (Concolor Fir). You Choose and We cut varieties: Balsam Fir, Colorado Blue Spruce, Fraser Fir, White Fir (Concolor Fir). 66181 North Lakeview Avenue, Sturgis, MI 49091. Phone: 269-651-3784. Open: from Friday after Thanksgiving, 10 am to dusk, seven days a week; Or call for a special appointment; Thank you and Merry Christmas!. Directions: Click here for a map and directions. Payment: Cash, Check, Debit cards, Visa/MasterCard, Discover. Click here for a link to our Facebook page. You-Choose and You-Cut varieties: Blue Spruce, Colorado Blue Spruce, Douglas Fir, Fraser Fir, Norway Spruce, Scotch Pine, White Fir (Concolor Fir), White Pine. 58041 48th Street, Lawrence, MI 49064. Phone: (269)674-3541. Bring your own saw. Pre cut or u-cut. Directions: 2 miles east of Lawrence on Red Arrow Hwy. to 48th St. 1/2 mile south on 48th St. Open: day after Thanksgiving from 8 am to dusk every day. 71522 County Road 215 South, Lawrence, MI 49064. Phone: 269-674-3075. Directions: Total Est. Distance: 3.80 miles from I-94. Go south from exit 52 on I-94 (Lawrence and Waffle House exit). Follow the curve to the right. Go to the stop sign at CR 215 (54th St.). Turn left and go aprox. 1.9 mi on CR 215. We are on the right. And for a map to our farm, Click here. Our products are usually available in November, December. Open: We are open Saturday and Sunday from 10 am to 6 pm from Thanksgiving to Christmas eve. Payment: Cash, Check. 56245 70th Street, Hartford, MI 49057. Phone: 269-463-5750. Email: treefarm@talltimbersmi.com. Open: daily for the season, beginning the day after Thanksgiving; Monday to Friday from 12 pm to 6 pm; Saturday and Sunday from 9 am to 5:30pm; Farm closes for the season approximately December 21st. Directions: Click here for a map and directions. Payment: Cash, Check, Visa/MasterCard, Discover. We also make fresh wreaths and garland on site. VCome to our Century-Old Barn and take a hayride with your family through fields of Fresh Evergreens to find the Perfect Tree of your choice. Warm up with a cup of Hot Chocolate while you Enjoy the smells of a Fresh-Cut Christmas Trees. At Tall Timbers Tree Farm, we will help you select the right tree for your needs. We will cut down your tree, shake it and bale it for you. You may also select one of our fresh pre-cut trees. Enjoy a wide variety of handmade wreaths and garland in or barn. Stop by our Warming House Gift Shop for decorations for your home and gifts for family and friends. You Choose and We cut varieties: Balsam Fir, Black Hills Spruce, Blue Spruce, Canaan Fir, Colorado Blue Spruce, White Fir (Concolor Fir), Douglas Fir, Eastern White Pine, Fraser Fir, Norway Spruce, White Pine. PreCut varieties: Balsam Fir, Blue Spruce, Canaan Fir, White Fir (Concolor Fir), Douglas Fir, Fraser Fir, White Pine. Wahmhoff Farms Nursery Choose-n-Cut 23090 M-40 Hwy, Gobles, MI. 1 1/2 miles south of Gobles or 2 1/2 miles north of M-43. Hours: Monday to Friday from 10 am-7pm; Sat & Sun 9 am - 7 pm. *Our Gobles location offers both Pre-Cut and U-Cut! The Root Beer Stand 4400 S Westnedge Ave, Kalamazoo, MI. North of I-94 on Westnedge at Kilgore, next to Outback Steakhouse. Hours: Monday to Friday from 11 am-8pm; Sat & Sun 10 am - 8 pm. The Root Beer Stand 3100 Portage St, Kalamazoo, MI near East Cork Street & Lovers Lane. Hours: Monday to Friday from 11 am-8pm; Sat & Sun 10 am - 8 pm. Crossroads Galleria 6414 S Westnedge Ave, Portage, MI. South of Plato's Closet and in front of Harding's Friendly Market. Hours: Monday to Friday from 11 am-8pm; Sat & Sun 10 am - 8 pm. Maple Hill Pavilion 5030 W Main St, Kalamazoo, MI. NW Corner of West Main and Drake Rd. in the Maple Hill Pavilion. Hours: Monday to Friday from 11 am-8pm; Sat & Sun 10 am - 8 pm.